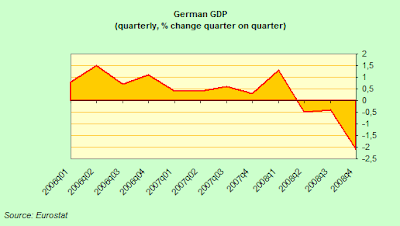 Wolfgan Munchau was complaining only last weekend about the extraordinary narrow-mindedness of Europe’s economic and political leadership in the face of the current financial and economic crisis, from Ireland in the West to Hungary in the East, and from Greece in the South to Sweden in the North. But more than narrow mindedness what we are faced with is innocence and inability to react, and frankly I am not sure which is worst. I say “innocence” because it is by now abundantly clear that they simply haven’t yet grasped the severity of the problems we face (in countries like Spain, or even Germany itself, let alone in the East), and I say inability to react, since they are always and forever moving too little and too late. The initial response to the banking crisis last October was one example (where we saw a landshift-style volte face in the space of only one week) and the way we are now confronting the need to live up to the promises then made about guaranteeing the banking sector, and in particular the “systemic” banks, would be another. As reported in my post yesterday (here) German Finance Minister Peer Steinbrueck became the first senior European politician to broach the topic earlier this week, when he stated that some of the 16 euro area nations are now â€œgetting into difficultiesâ€ and may need help, citing Ireland as an example. 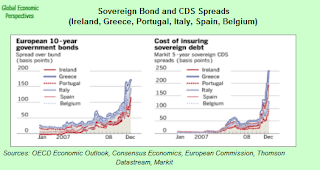 French officials are also reportedly concerned about how the current “stand alone” sovereign debt situation is leading to widening spreads on Austrian, Irish, Greek and Spanish debt as the cost of insuring against default rises to records. What we have before us is not simply a case of seeing “fiscal irresponsibility” punished, it is a mechanism whereby the eurozone can be peeled apart, and where those states who enter a negative economic growth-bank bailout-fiscal deficit dynamic which means the cost of financing their debt (and thus their bank bailouts) rises so prohibitively that it virtually excludes the possibility of giving further fiscal stimulus to their sinking economies, and does so in such a way that a self reinforcing (and self fulfilling) process may be produced, a process which only leads in one direction and to one conclusion: that of sovereign default. Are Bailout’s Possible Under Maastricht? â€œThe European Commission stands ready to provide a loan of â‚¬6.5 billion to Hungary,â€ the EU executive said in a statement on Wednesday (29 October), adding that â€œthe concrete modalities will shortly be finalised in cooperation with the Hungarian authoritiesâ€. Under the plans, the Commission will borrow money from the markets using EU-denominated bonds and then lend it to Hungary, without drawing from the EU budget. The facility is established under Article 119 of the Treaty.It is the first time that Brussels has used the instrument to help an EU country (see background). The facility foresees an overall ceiling of â‚¬12 billion of outstanding loans. This funding is limited to EU countries which are not part of the euro zone. The â‚¬12 billion ceiling currently provisioned for in the bond facility has not so far been reached, but it has long been evident that other Eastern EU countries would need to draw from the facility for financial help. Thus it is hardly surprising to learn that French President Nicolas Sarkozy had already proposed raising the ceiling to â‚¬20 billion at an EU summit on 7 November. “I will propose on 7 November that the European Union itself, which has 12 billion available to support a certain number of liquidities and to support a certain number of states, should go up to at least 20 billion (euros) to increase our capacity to respond to the crisis,” Sarkozy said, according to Reuters. As one EU official told journalists at the time “the Commission could also change the regulation and lift the ceiling”. Or, in other words, when needs must, it will. The principle of borrowing money from financial markets on behalf of the European Community has previously been applied to grant aid to extra-EU countries, in particular before the 2004 enlargement. Kosovo, Moldova and Georgia are all currently receiving financial help through EU loans raised on the market. In January 1993, Italy, a member of the European Community (the EU’s forerunner), was granted an eight billion ECU loan to support its strained balance of payments. Since then, no member state has received financial help through this instrument. The gateway for the coach and horses is also being prepared on another front, as the Financial Times reports this morning. In this case we are talking about the European Investment Bank, which, according to the FT, is set to lend the European car industry 7 billion euros in the first half 2009 to support the manufacturing of environmentally clean vehicles. This is already a substantial increase on the approximately 2 billion euros a year the bank extended to the industry before the crisis, and there may be more, much more, to come. Pathways are being prepared, even as the wheels on the coach are oiled and the horses’ mains groomed. Philippe Maystadt, the bankâ€™s president for the past decade, revealed the â‚¬7bn figure to the Financial Times, as he explained the EIBâ€™s plans to shoulder a bigger financing burden in crisis-hit Europe. Member states have already asked the EIB to increase its annual lending programme by â‚¬15bn ($19.2bn, Â£13.3bn) to â‚¬63bn for this year and next in an effort to revive the economy. So why, if there behind the scenes so many preparations are now being made did I start this post by saying that more than narrow mindedness, what I felt we were faced with is innocence and an inability to react? Well basically, because I think that Europe’s leaders are still in general denial on the scope of this problem. We are not talking simply of little cases, like Greece and Ireland, we are talking about potentially much harder chestnuts to crack, like Spain, and Italy, the UK, and even Germany itself. Remember Germany’s economic is now contracting at an almost astonishing pace, and German bonds are getting harder to sell all the time. The full extent of the problems in the German banking system, as defaults mount in Spain and Eastern Europe, is yet to be measured. Only today German Chancellor Angela Merkelâ€™s Cabinet approved a draft bill allowing the state to seize control of property lender Hypo Real Estate Holding AG, paving the way for the first German bank nationalization since the 1930s. And the volume of assets thought to be likely to need to be bought by any bad bank (or banks) created is very large. Hypo’s loans alone are thought to total almost 260 billion euros, and numbers in the 400 to 600 billion euro range are being mentioned. So the fear here is not that a German sovereign default is looming, but that German debt may no longer maintain “benchmark” status, and thus the rate of interest the German government may have to pay to maintain its debt may rise, again impeding efforts to help maintain the economy afloat, and almost inevitably biting into the country’s already strained health and pension systems. Finance Minister Peer Steinbrueck was quoted by the Frankfurt Allgemeine Sonntagszeitung weekly newspaper as saying he could “not imagine (the establishment of a “bad bank”) economically or above all politically”. A bad bank would need to be financed with 150 billion to 200 billion euros of taxpayer funds, he said. “How am I supposed to present that to parliament? People would say we are crazy.” Steinbrueck said no one could predict whether the rescue fund would need to be expanded given mounting losses at banks, but noted it still had room to distribute more money. And one last example for today, of how the one half (the Commission) doesn’t know what the other half (the Nation State leaders) is up to. Joaquin Almunia (who is so often “really out to lunch” on economic issues, he is, as they say “challenged” by the complexity of macro economics, see for example this post here) has warned that Brussels could take action soon against EU member states which let their budget deficits rise above the 3% threshold (see P O’Neill post here). The EU’s executive arm plans Wednesday to examine the budgetary circumstances of several countries, including France, Germany, Greece, Ireland, Malta, the Netherlands and Spain, to see whether action is needed. Most of them, notably France, Greece and Spain, have already forecast that their deficits will blow out beyond three percent of gross domestic product (GDP) — the limit set out in the EU’s Stability and Growth Pact. France, which has called for the EU limit to be eased as governments grapple with the worst economic downturn in decades, has said it expects its deficit to be 3.2 percent GDP in 2008 and 4.4 percent in 2009. Ireland’s deficit is expected to blow out to 5.5 percent in 2008, and then 6.5 percent in 2009, with Dublin hoping to bring things back into line in 2011. Spanish authorities expect a deficit of 5.8 percent this year. Germany, Europe’s biggest economy, has forecast three percent this year but believes the figure could grow to more than four percent in 2010. Greece, for its part, foresees a deficit of 3.7 percent in 2009. The Netherlands is due to publish its latest figures Tuesday and might just scrape through. Given the difficult, and unforseen, pressure we are all up against, this is, quite frankly ridiculous. Not that rising fiscal deficits, and rising debt to GDP ratios, are something we should be casual about, but I think what we need is a certain loosening of the rules in the short term, to be followed by a much stricter tightening as we move forward. And do you know the mechanism I would use to discipline the reluctant states when it comes to paying off the accounts run up during the emergency? Why yes, you’ve got it, the availability of those much-easier-to-finance EU backed bonds. You see while the first argument in favour of EU bonds may be an entirely pragmatic one, namely that it doesn’t make sense for subsidiary components of EU Inc. to be paying more to borrow their money when the credit guarantee of the parent entity can get it for them far cheaper, the longer term argument in favour is that it may well enable the EU Commission to become something it has long dreamed of becoming – an internal credit rating agency for EU national debt. Basically in the mid term the EU bonds system can only work if it is backed by a very strong Lisbon type reform pact for those countries who apply to make use of the facility. This is what now needs to be worked on. And how do we know that that there won’t be yet another round of backsliding on all this? Well we don’t, this is the risk we just have to take, but sometimes you do need to simply cross your fingers and jump, since the burning building behind you looks none to attractive either, but what we do know is that since there will now be a mechanism whereby the bad behaviour of the few really can penalise the many financially, then there really will be some meaningful incentive to generate a pact, this time, that really has teeth to stop that penalisation taking place. I don’t understand what do you except. I think there is nothing we can do, it’s far too late, the problem start in the 80s. We are are the end of a neo liberal era started with Reagan and Thatcher. I’m french and I hope sarkozy will do very little against this recession. I remember in 1981 when the Socialist and FranÃ§ois Mitterand became president, there was a “plan de relance”, and because our industry is not strong “la relance” was for Germany or Japan, exactly like the Obama plan I bet. I was astonished that when the cost of insuring debt exceeded the interest rate at ECB there was not a decision to refinance that debt at a lower ECB rate? What the ECB is doing is creating a run on banks within it’s own system. The ECB should be easing and refinancing debt in this deflationary cycle which reduces M3 obligation and is not inflationary, but a means to limit the spiral of deflation. I was astonished and wondered if the ECB was running for office? It was as if politics locally had led the ECB to make a decision that would ensure destruction of the ECB. The last decision not to ease was most probably a historic blunder that economists will study for decades. The US was much more decisive, where we recognized deflation, and acted! I think now that the amount that ireland must pay exceeds the interest that the ECB states, all transactions are by definition negative or deflationary. Management like that demonstrated in the recent decision not to ease again I feel will be studied at the MBA schools for decades. It was as if there was not an understanding of simple exchange. A German sovereign bond auction failed yesterday amid growing danger signs for governments as they attempt to raise record amounts of debt to pay for fiscal stimulus packages and bank bail-outs, writes David Oakley . It was the second successive failure this year of a 10-year Bund auction – usually one of the most sought-after – as demand fell 20 per cent short of the â‚¬6bn (Â£5.4bn)the German government wanted. The outcome signals trouble for governments as a record $3,000bn of debt is ex-pected to be raised this year in sovereign bonds – three times that of 2008. German bond auction failures were rare until the credit crisis. Before the seven that failed last year, the last German bond auction not to reach its target was in July 2000, after the dotcom crash. With spreads between German yields and those of other eurozone countries close to record wides, investors bought other eurozone paper this week be-cause of the extra premiums they could obtain for this debt. Greece, the lowest-rated eurozone country that suffered a downgrade last month, comfortably sold â‚¬7bn on Monday, although it had to pay much higher yields than existing debt to sell the notes. “Ultimately, the European Central Bank could purchase bonds from vulnerable countries in the open market. That would amount to a full monetary bail-out, and the de facto creation of an EU debt union. Doesn’t the buying of Greek bonds mean that some investors are betting that the ECB will back these bonds? On my blog, I made again the case for an EU bond. I think we are immediately ready for a joint EU bond for an initial market of over 120 billions â‚¬. Just go back to the Delorsâ€™ idea and start funding the EU budget with an issuance of EU bonds. As I wrote at present the EU budget is funded in any case annually by resources members statesâ€™ treasuries, which issue themselves bonds as they are in deficit. So just make a common issuance and members states will contribute for their share. Technicalities can also be worked out in the same way we did for the introduction of the Euro. Itâ€™s not a problem. When a market is created EU bond issuance can be scaled up for other purposes (including banks recapitalization or other country rescue packages) as needed and appropriate. Itâ€™s a kind of situation where you create the instrument first (like the Euro) and by this mean you continue the integration. […]Why We Need EU Bonds | Seems a lot like what’s going on in the U.S. Hope we can transition through this mess without complete collapse.